Q. Implementation of Logic Micro-operations? For implementationlet's first ask questions how many logic operations can be performed with two binary variables. We can have 4 possible combinations of input of two variables. These are 00, 01, 10, and 11. Now for eachof these 4 input combinations we can have 24 = 16 output combinations of truthvalues for a specific function. This suggests that for two variables we can have 16 logical operations. Above stated fact would be clearer by going through the given figure. 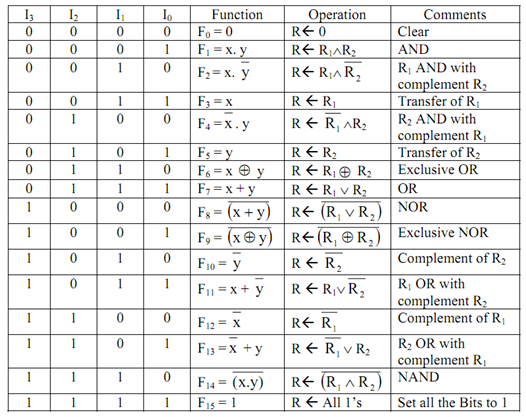 Please consider that in figure above micro-operations are derived by replacing x and y of Boolean function with registers R1 and R2 on every corresponding bit of registers R1 and R2. Every one of these bits will be treated just like binary variables. In various computers only four: AND, OR, XOR (exclusive OR) and complement micro-operations are implemented. Other 12 micro-operations can be derivedfrom these four micro-operations. Figure belowdisplays one bit that is the ith bit stage of four logic operations. Please consider that circuit comprises 4 gates and a 4 × 1 MUX. The ith bits of Register R1 and R2 are passed through circuit. On the base of selection inputs S0 and S1 desired micro-operation is attained. Object Orientation and Analysis An Object is anything that exists within the problem domain that can be recognized by data and/or behaviour. An example of an object is a bike. Class is a user-defined data type in C++. It can be formed to solve a particular kind of problem. After creation the user require not know the specifics of the working of a class.